PERT-WEEK - Looking Back At WORZEL GUMMIDGE | Warped Factor - Words in the Key of Geek. John Devon Roland Pertwee (he dropped the 'h' from 'John' after a playbill mis-spelled his name in the 1930s), played perhaps the second most remembered of all the classic Doctors, thanks to a hugely popular five year shift on Doctor Who between 1970 and 1974. But for a generation of children who were born during those years, Pertwee will likely be remembered as another much loved character - the lovable scarecrow Worzel Gummidge. Jon Pertwee was familiar with the Worzel Gummidge books from his youth, they had first been published in 1936 and adapted for radio in the 1950s, and it was he who suggested a new small-screen version to Southern TV. Pertwee helped to develop the concept, which varied a great deal from the source material, create and promote the series. He felt that playing the title character, and mixing slapstick and intimate sentimental scenes, produced some of the favourite performances of his career. The series revolves around Worzel Hedgerow Gummidge (Jon Pertwee), who is supposed to scare crows on Scatterbrook Farm in Ten Acre Field, but instead much prefers roaming the countryside and villages having adventures. The humans who know of his existence are the children living on the farm, John (Jeremy Austin) and Sue (Charlotte Coleman) Peters, and of course the man who brought him to life, his creator The Crowman (Geoffrey Bayldon) who commands all the scarecrows he makes. The humans that don't know he comes to life, but very often come into contact with him, living and not, are the children's' father Mr. Peters (Mike Berry), the farm owners Mr. Jack Braithwaite (Norman Bird) and Mrs. Betty Braithwaite (Megs Jenkins), easily angered P.C. Parsons (Norman Mitchell) and the seemingly wealthy but tight with money Mrs. Bloomsbury-Barton (Carry On's Joan Sims). Many well known British actors and actresses guest starred on the series, including; Barbara Windsor as Saucy Nancy, Bill Maynard as Sergeant Beetroot, Lorraine Chase as Dolly Clothes-Peg, Mike Reid as Fairground Owner, Billy Connolly as Bogle McNeep, Bernard Cribbins as Jolly Jack and Fawlty Towers' Connie Booth as Aunt Sally II. 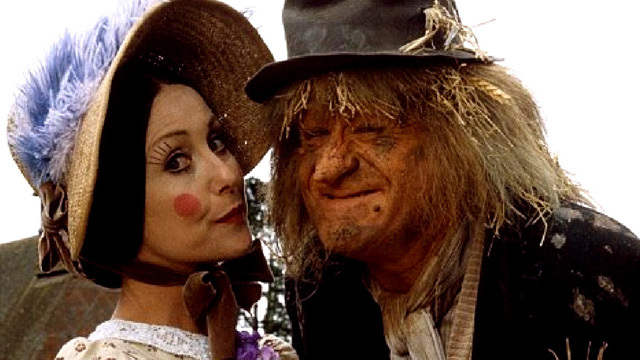 Many of the adventures Worzel has involve him pursuing large wooden doll Aunt Sally (Una Stubbs), who is always getting away from her easily stressed owner Mr. Shepherd (Michael Ripper) and used in fairs to have wooden balls thrown at her for prizes. Even though she is greedy and cruel-hearted to him, Worzel continues trying to make her happy in his own poor meaningful ways. And if there was "a cup o' tea an' a slice o' cake" in it for her, then she'd go along with him. Boozy McCoo! One of the most memorable aspects of the show were Worzel's many interchangeable heads, made of turnips, mangel wurzel or swedes, all with particular traits and uses, e.g. Reading Head, Thinking Head, Wangling (fishing) Head, Singing Head, Posh Head, Jolly Uncle Head and many more. The transformation was quite creepy, but gave Pertwee a chance to adopt some different mannerisms. Jon Pertwee really is wonderful as the lovable scarecrow with his tragic go nowhere love and his hilarious antics. Una Stubbs gives a good performance where you both love and hate her, and Geoffrey Bayldon, who is better known as Catweazle, is a brilliant supporting character with his wise nature, and the show suffered without him after he moved on at the end of series 4 after 30 episodes. Series 5 saw a change in channel (to Channel 4) and a move to New Zealand. Only Pertwee and Stubbs remained for 'Worzel Gummidge Down Under', and Pertwee was said to have been unhappy with the scripts as the series' did not have "the underlying morality" of the first 4 seasons. He's right too, in fact the best thing about the New Zealand shows is that a young Peter Jackson worked on the special effects for the series. In 1989, after 22 more episodes, the man who had cancelled Doctor Who, Michael Grade, called time on old Worzel. I'll be bum-swizzled! The format was quite simple, the make-up effects were marvelous, and the overall feel of the series was sweet and fun. 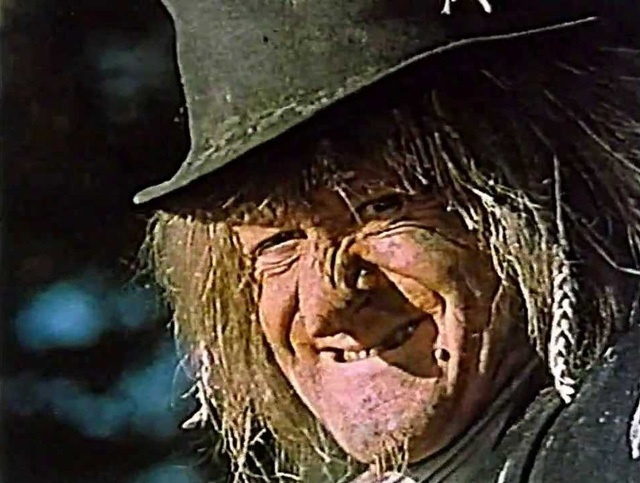 Worzel Gummidge is a product of a more forgiving, gentler era of children's television. It's aged, and if watching today you'll probably say to yourself that they don't make kids show's like this anymore, and that's more the pity because it's still a wonderful family comedy series to enjoy.